Grimlock comes armed with an exclusive shield and green battle sword, ready to stop invading Decepticons on Earth and he'll prevent the fall of Cybertron! Bumblebee has an awesome new finish with an upgraded battle sword, complete with silver grip, and a brand-new paint job with more headlights, more stripes, black boots, blue rims, gray hands, and more! Get this exclusive from Entertainment Earth! Transform your toybox with the Transformers Asia Kids Day Robots in Disguise Premium Grimlock and Bumblebee 2-Pack - an Exclusive! 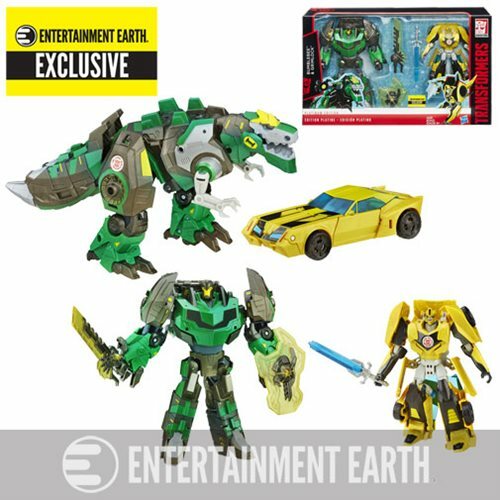 This premium pack portrays protagonists Bumblebee and Grimlock in a whole new light. Sure, they may spend all day in a junk yard, but in this set they have a shiny new finish and some cool new features! Bring home two of the most popular characters from Transformers: Robots in Disguise with this awesome boxed set of transforming plastic action figures.